"Nikolić" is a creative pottery workshop producing terracotta objects. We created a collection of terracotta named "Serbia" based on the old pottery trade, with advanced and new technological solutions and creative design. 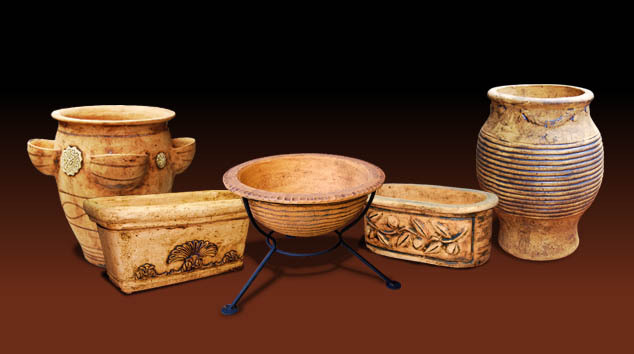 "Nikolić" pottery is a traditional creative workshop created by the family tradition pottery craft in the 1930s. Our grandfater Bora gained mastery in Pirot pottery school (1931) and the workshop was moved to this area after the Second World War, in 1946, when the whole family moved to Smederevska Palanka. The present form of the workshop has existed since 1986, when the production program was changed as it needed to readjust to the market needs. In this period the more decorative interior and exterior ceramics and ceramic ornaments have been produced. Our products can be found in many important places such as the national restaurant "Genex", the "Omorika" in Kopaonik, the "Galenika" factory, the "Hayat" hotel and many other restaurants and public places. We have exhibited our works in several individual exhibitions throughout Serbia. Based on the old craft and with the use of new technological solutions and creative design, the result is the collection "Terracotta Serbia". With clay in the environment, of known geographic origin, we create products that have specific traditional and modern expression, and which are made solely of natural and ecologically clean materials. Our products are well fitted in various ambience, giving the warmth or terracotta tones everywhere. The products of our workshop are diverse and the production is very dynamic, thanks to inexhaustible source of ideas. The production program consists of several entities: jars and amphoras, garden pottery, lighting and decorations.